I first noticed these strange tendrils on the underside of Hawthorn (Crataegus douglasi) at a city park a couple months ago, but only just got around to photographing them. I thought they might be some sort of aphid galls after noticing that the leaves were covered with the insects. But the truth, it turns out, is far more spectacular! This is actually the fall life-stage of a rust fungus that infects Cedars (and Junipers). 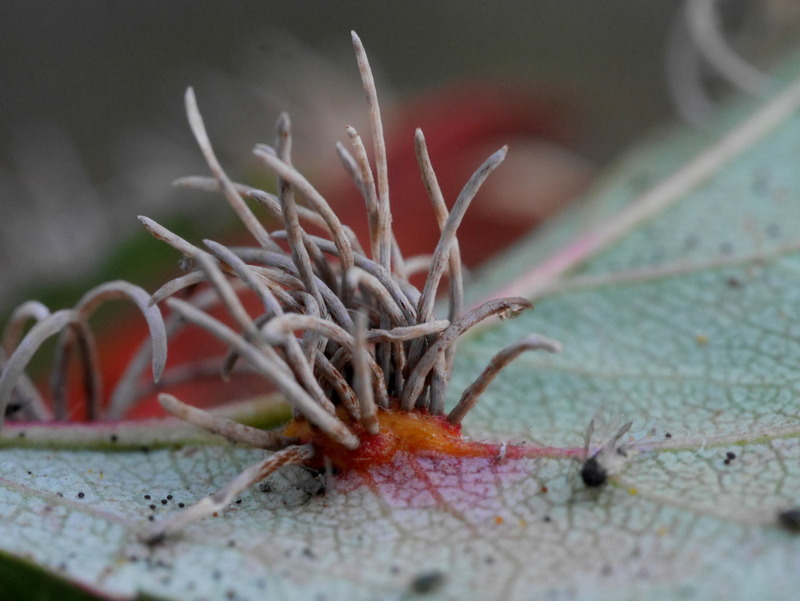 The fungus overwinters on Cupressaceous conifers, producing a small gall that grows large, orange gelatinous horns after spring rains. These jelly tentacles release spores that then infect the leaves of Rosaceous trees and shrubs such as Crataegus, Malus, and Sorbus. By late summer, fungi on these Rosaceous hosts produce the large porcupine-like clump of tendrils seen here. These tendrils release more spores that continue the cycle anew! I’m in love. What a phenomenal fungus!